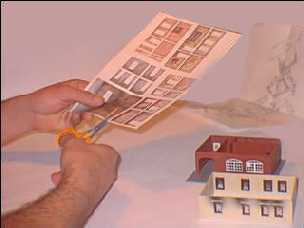 In this article I show the making of a simple structure kit, in this case a Pola structure. Without any special skills or modifications, straight out of the box to the finished model. 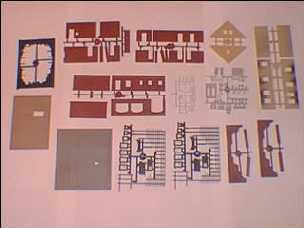 This to give beginners in the modeling hobby an idea, and as a sample to compare with other project in this homepage. With the aid of the instructions, we check to make sure that no parts are missing. We also study the instructions, and parts, to become familiar with this structure. 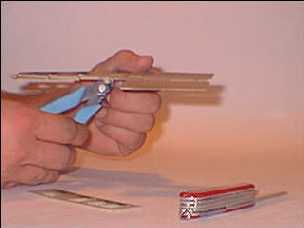 With a knife, or better yet, with a special side cutter as shown on the picture, we remove the parts. After this we file the cuts smooth, and other sides, which may have excess material on it. Never brake the part loose, since this will leave damage to it. After the parts have been removed, check them for a proper fit, they may require some attention. The walls will be made first. We can new glue the windows and doors with plastic glue. Be careful and use only a small amount of glue on the inside, since the glue will leave marks on the outside, if spilled. In almost every Pola kit, Pola use a thin clear plastic sheet, to duplicate "glass". With scissors cut each piece, slightly bigger then the window. 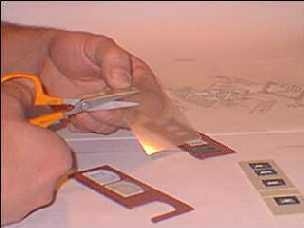 Carefully glue them on to the windows, but pay attention not to spill glue, as this will not be removable. The walls can be glued together. Pay attention to the order and make sure they are not upside down. Study the instructions carefully. I always glue two walls and then the two corners together. Sometimes the photo on the box can be a guide. 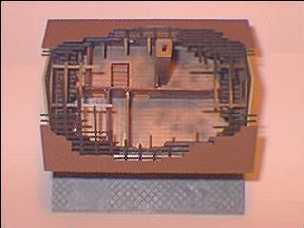 When the four walls are finished, they are glued to the bottom. New the inside walls can be glued in place. 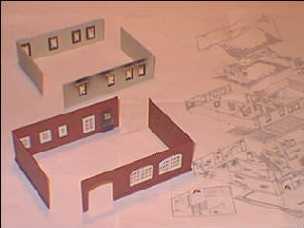 This type of structures from Pola, use separate floors, and in this instance the ceiling becomes the bottom of the second floor, and will not be glued to the first floor. 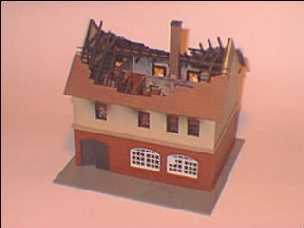 The roof on this structure is burned, and therefore the interior walls are visible. 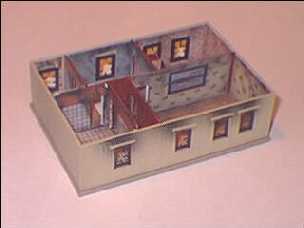 Pola include a sheet of paper with pictures to coffer the walls. This is best glued with deluded white glue, or "Elmer" school glue, on to the plastic walls. The inside from the outside walls, the inside walls and the floor are covered with this paper. I think it is easier to do it this way, then when covering the walls from a assembled floor. 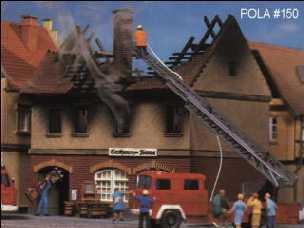 The model is a burned house, so in reality would the wall covering and paintings not be burned as well? 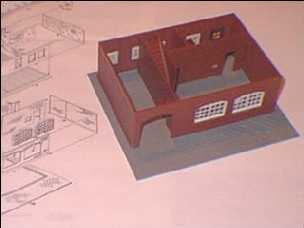 This is something that I do later, this article describe the building out of the box, no modification of any kind. 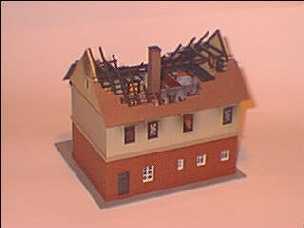 The ceiling, or the floor of the attic, can new be glued on to the second floor. There is enough room left to make any changes to the interior later. We also glue the last outside walls. The model is almost finished. Finally we install the chimney and the roof tiles. The model is new finished. This is the front. 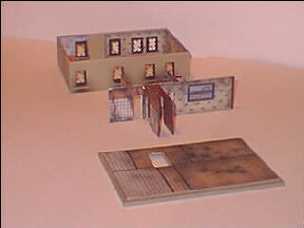 Pola included some interior parts, like wardrobes, a bed, but they really need some painting. I didn't install them yet, I wait until I paint them later. 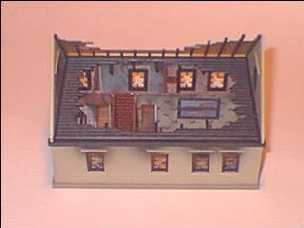 This is the model from the back. And a birds eye view, from the top.